A great friend of mine, Roger Sutton, keeps telling me the first rule of boating is to keep the boat in the water and the water out of the boat. Of course that’s how we normally like to roll but there are times when you must pull the boat out of the water. This was one of those times. The hull needed new bottom paint and we had a thru hull to replace as well as a packing gland. So, as much as we hated to do it, the time came to make arrangements for the haul out. Now to know my Dan is to know he doesn’t do anything he hasn’t thoroughly researched and this was no different. Hauling your boat for painting and repairs is a costly proposition at best. It’s not something you just jump into without preparation and thought. 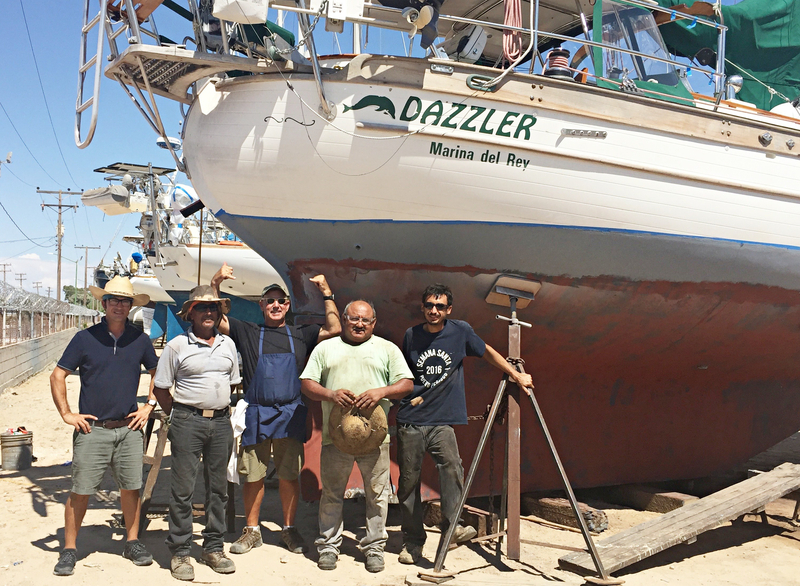 After months of research and talking with other cruisers Dan made the decision that we would haul out in the Northern Sea of Cortez at the Astilleros Cabrales Boatyard in Puerto Peñasco, Mexico. This turned out to be an excellent decision. We arrived in Puerto Peñasco three days before our haul out date. We stayed at the Marina Fonatur just across the way from Cabrales. It’s certainly not like the typical marinas we usually stay in as it’s very commercial. We were surrounded by shrimp boats and party cruise boats but it did the job just fine. The morning of the haul out we moved from our dock at the marina over to a dock just in front of Cabrales. Salvador (one of the owners) came to the boat before we moved to the ways and boarded to assist us with positioning and lines. I’ve never been on a boat during a haul out before so this was a bit nerve racking for me. We had our lines and fenders ready to go and the time came to move. I was on the starboard side at the bow. My first job was to get my bowline up to the guy on the wall. My most important job was to make sure I kept us pushed away from the rock wall on the starboard side. Ironically enough I wasn’t worried at all about keeping us away from the wall. I had the boat hook ready. I was, however, a bit uneasy about getting my line to the yard worker. He was standing about six feet above me and we had wind pushing us a bit. With rock walls on three sides of you there is little room for error. Fortunately I hit my target the first time. “Whew! Thanks God”, I say under my breath. Now all I have to do is grab the hook, keep us off the wall and my job here is done. Dan’s an amazing captain and he certainly knows Dazzler. He slid her right into the spot perfectly. All lines were now on the wall with the yard workers and the lift started to pull us out of the water. Dan and Salvador tied lines between the sling straps to keep them from sliding as Dazzler was lifted. Once the lines were tied and the bow pulpit was raised high enough for us to get off, we all climbed off the boat. Not being extremely graceful, my next worry was that I’d fall in the water on my way off the boat. That would have been very ugly! But, Dan and Salvador were right there helping me onto the wall. From here the crane started pulling Dazzler out of the water. She wasn’t up very far when everyone started to have a little concern about the strap placement. Salvador had the crane driver stop and we began to assess the situation. After a bit of conversation and some advice from Salvador’s father it was decided that Salvador and Dan would get back on the boat and move the straps a bit closer to the center. Once that was done she came out of the water with no hassle at all. When you are watching your home sway back and forth as it is being rolled through the boat yard, across the street and onto the hard it can be a bit stressful. And, it’s a painfully long process. From the moment she was out of the water to the time she was on the hard, fully secured with jack stands in place was a little over an hour and a half. I’m pretty sure I now hold the record for the longest time anyone has ever held their breath. Don’t get me wrong. I had complete faith in Salvador and his team but it’s still a pretty tense time. You go in with the understanding that once the boat is out of the water just about anything can happen. After all it’s 16 tons being held above the ground with two straps on a rolling crane. There’s an inherent risk that goes along with this process and you just have to accept that. Once she is set it place she is balanced on a few railroad ties and six metal jack stands. I say a few because when I think of 32,000 pounds being held up by a handful of metal stands and a couple of railroad ties it just doesn’t feel right. At least not for this girl. After Dazzler was secured on the hard they brought stairs over so we could get on the boat, work and get things we needed for the motel. Being the fearless gal I am, I didn’t waste any time getting up the stairs and onto the boat. That’s when fearless was no longer an adjective I would use to describe myself. The moment my feet hit the deck I was almost paralyzed with fear. There I am standing about 15’ above the ground on a boat that is being “balanced” on some metal stands. A boat, mind you, that is no longer swaying and rolling in the water. One that is as stiff and still as it gets. All of the sudden I could feel myself getting weak and very freaked out. I told Dan I couldn’t do it and I had to get off. Of course he thought I was nuts but I didn’t care. I made a mad dash down the stairs and onto the safety of the yard. It took about five or ten minutes for me to regroup. I knew I had to be able to get up there. After all, we have work to do while she’s here and I still needed to pack my clothes for the hotel. Time to put on my big girl pants so I took a deep breath, climbed back up the stairs and just tried to focus on the tasks at hand. Realizing that I wasn’t feeling very comfortable with the situation, Dan made certain that we didn’t stay there long. We got our things and headed up to the office where we waited for Doug, the motel manager, to pick us up. I couldn’t wait to get to our room and make a cocktail. It had been a very long, hot and stressful day and it was only about two o’clock in the afternoon. Our motel was truly delightful. We stayed at La Palapas Condos & Casitas. It is quintessential Méxicano. The courtyard/parking lot surface is covered in gray rock and it is fenced in with a large iron gate at the front. We were greeted by the most adorable puppies, Lilly and Reina and a couple of older dogs, Yogi and Bob. These sweet canines became my buddies over the next couple of weeks. When things got stressful or we were tired from a long day, I sat at the outside table, under the palm frond thatched roof and enjoyed a cocktail and some sweet puppy lovin’. The casita itself was lovely and very clean. Best of all, the A/C worked…almost too good! We opened the door to an ice cold blast of air that was so welcome after the hot day we had at the yard. There was a nice little kitchen that boasted a refrigerator, sink, stove, small table and chairs and all of the basic kitchen utensils and cookware we could possibly need. The floor was Mexican tile and the walls were painted with a rustic, rag finish that included hand painted vines and flowers around the door. The bathroom had a huge shower and big counter top. I know the guys could care less about that but to a woman, a place to spread out in the bathroom is priceless, especially when you are used to living on a boat where you barely have room for a toothbrush and toothpaste. Yes, our temporary home was perfect! It was walking distance to the boatyard and Doug was more than accommodating and helpful. Of course the puppies were a wonderful distraction from all the work and chaos we experienced as well. Boat on the hard and us settled in our room, it was time for a few beers and a little down time but not for long. The following day we had to go back to the yard to do some work on the boat. I was dreading getting up on her but I knew I had to do it. After a refreshing and enjoyable afternoon we were both ready to head to the yard the following day to get our projects competed. We decided that we would install the new packing gland and the thru hull ourselves. I swear there is nothing Dan can’t do! I don’t really do much. I just stand by and hand him tools as he needs them but he says that’s doing a lot. I think he just wants me to feel useful but either way, I do what I can to help. **A little side note here. I had expressed my concerns over how boats are stored on the hard to Salvador the next day. He gave me some very helpful information. He asked if I had ever been on a motorcycle and having owned a Harley I, of course, said, “Yes”. He asked how much it weighed and I told him it weighed about 800 lbs. He then said, “And you held that up by just balancing on two feet?” It was then that I started to understand the physics of the process and that made me feel a hundred times better about getting on Dazzler on the hard. In fact, from that point forward I rarely even noticed the difference. Much thanks to Salvador for helping me through that little dilemma. Check back for our articles on our stay in Puerto Peñasco and the final splash down!